RadHtmlChart offers design-time support as of Q2 2012 SP2. The advanced features are accessed through the Smart Tag of the control by clicking on the Open Configuration Wizard link shown in Figure 1 between the Layout and Ajax Resources sections. Figure 1: The Smart Tag shown in the top right corner of the RadHtmlChart lets you do some quick RadHtmlChart tasks such as choose a data source, change the width and height, open the Configuration Wizard, add Ajax resources, choose a skin for your RadHtmlChart, or jump to the learning center. The Smart Tag of RadHtmlChart begins with the data source configuration (Figure2). You can either choose an already existing declarative data source from the list, or add a new one. 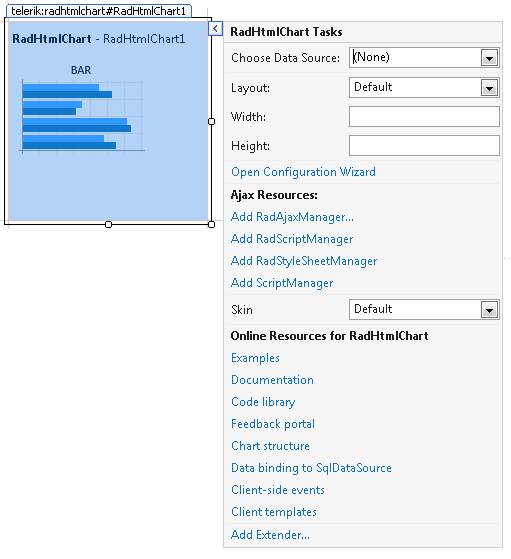 Figure 2: You can use the Data Source Configuration Wizard to set a data source for a RadHtmlChart. 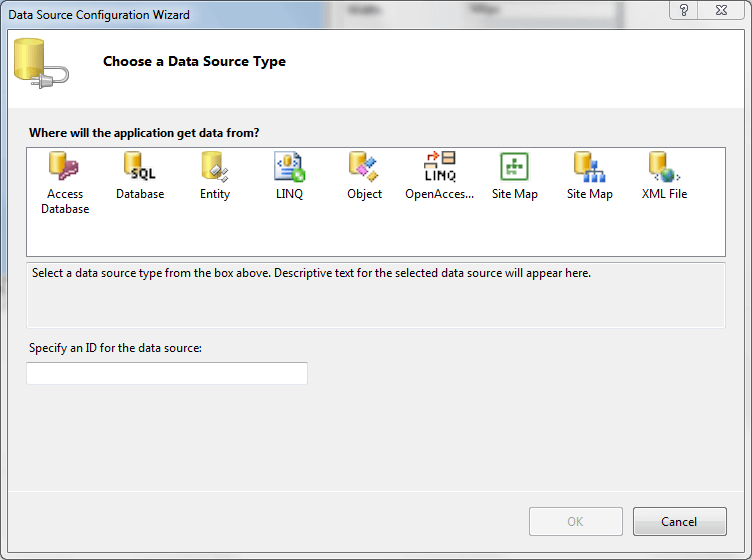 The second option (Figure 3) is to configure the data source, regardless of whether it was just added or already exists.This is done either through the chart's Smart Tag (the Configure Data Source option) or through the Smart Tag of the data source itself. Figure 3: Configure a data source in the design environment by clicking the RadHtmlChart Smart Tag and then select Configure Data Source. The Layout section of the Configuration Wizard lets you change the height and width of RadHtmlChart. You can add Ajax resources (Figure 1) to your RadHtmlChart by clicking the Smart Tag while in the design view. The Add RadAjaxManager... link adds a RadAjaxManager component to your webpage, so you can configure partial postbacks through a comfortable control. The Replace ScriptManager with RadScriptManager link replaces the default ScriptManager component that is used for AJAX-enabled websites with RadScriptManager. If there isn't a ScriptManager on the page this link will allow you to add one. You can change the skin that your RadHtmlChart displays by clicking the Smart Tag and using the Configuration Wizard (Figure 1) to select from a list of skins. The Skin dropdown lists all available skins for the control so you can select one that matches the look and feel of the rest of the page. The skins are displayed via small images to give you a better idea of the color scheme they use. RadHtmlChart provides a section of the Configuration Wizard that lets you jump to online examples and the code library. The last section of the Smart Tag (Figure 1) provides several links that let you navigate to these RadHtmlChart online resources. You can also search the Telerik web site for a given string.